Popcorn Time is always the one that constantly attracts controversy. See, some say the app is illegal as it's the so-called Netflix's pirates to let users stream movie torrents and watch pirated movies and TV shows. Others insist that it's not really illegal under strict etiquette rules, but unethical actually. Might be more proper to say it's always operated in a legal grey area. Confronted with such a controversial movie app, beyond doubt, Apple didn't give the official nod to this app. That's why you can't find it in the App Store. But according to the devs, 8,000 people try to install Popcorn Time app on their iPhones on a daily basis. What a huge demand for this Popcorn Time app! How to resolve the contradiction between demand and supply? Well, the majority of users would think of jailbreaking iPhone so as to install the Cydia. It's undeniable that it's an efficient way to easily download and install Popcorn Time app on iPhone. Supposing you wanna have a try of this solution, first of all, learn how to jailbreak your iPhone iPad and then the whole Popcorn Time app downloading process is easy as winking. Of course, not all the users plan to jailbreak their iOS iPhone iPad with a view to privacy, security, durability and such like. What if you don't want to jailbreak iPhone or iPad, but have no idea how to get Popcorn Time app on iDevices either? No biggie! Here I show you how to download and install the app using the iOS Installer without jailbreak. Step 1: Go to Settings > General > Date & Time > Turn off 'Set Automatically' and change the date to August 1, 2014. Step 2: Open Safari, go to the Popcorn Time iOS app download site, and click on the green box to download it. Step 3: Press the button "Install" to begin install Popcorn Time iOS for iPhone iPad. Step 4: Set the date back to 'Set Automatically'. Hit 'Trust' on the pop-up window. Then the job is done! You can finally stream and watch Popcorn Time movies on your iPhone iPad without jailbreak. 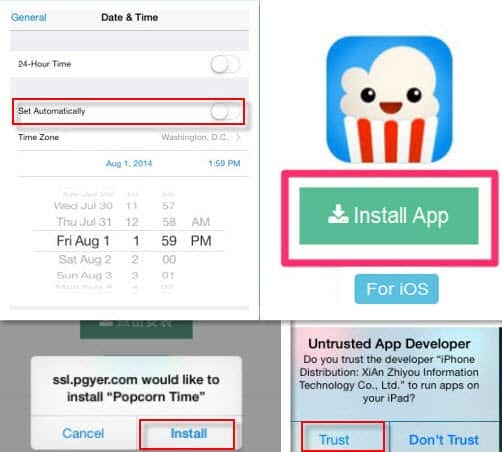 If it's still not working, follow the tips to download free movies to iPhone. Popcorn Time Not Working on iOS 12? How to Fix it? It's mentionable that the above tutorial on how to download Popcorn Time app for iPhone iPad is appropriate for iOS 10.3.1 or 10.9. If you upgrade to new iPhone or update your iPhone to iOS 12, the app is no longer working, boots up and then crashes or needs a password to gain access. Drive you crazy? Don't be, my friend. You can fix Popcorn Time not working on iOS 12 problem with the below solutions. It's nearly impossible for you to guarantee the place you stay at is awash with signal or Wi-Fi, and once you enter a network-deficient area, your Popcorn Time or PlayBox iOS app is out of run. In such case, only the downloaded movies on iPhone iPad can enrich your entertainment life. So here you can apply the top-notch movie downloader - MacX Video Converter Pro to download free Hollywood Bollywood movies in 4K/1080P/720P from YouTube, Dailymotion, Crackle, PopcornFlix, comedycentral, Fmovies, MovieMast.in, moviewatcher.to, Mydownloadtube.tv, housemovie.to, Storify, etc. 300+ movie sharing sites in full length. Also an iPhone movie converter to convert movie to iPhone MP4, MOV, M4V in H264 or H265 codec, edit movie length (trim/crop) and adjust movie resolution, frame rate, etc. PlayBox, self-boast as the best entertainment app, is the strongest alternative to Popcorn Time. Also as a free yet safe app, this movie app lets users watch movies TV shows on Android, Windows Phone, as well as iOS iPhone iPad (iOS 12 included). Thus, you can watch movies on iOS iPhone iPad on PlayBox app, instead of downloading Popcorn Time app and involving other complex stuff. Need to remind you that it takes about 24 hours for PlayBox for iOS to get activated but then when it's done you can stream, download and airplay movies to your fashionable iPhone, iPad Pro, iPad mini/Air, etc. Warm Prompt: The free movies downloaded from online movie sites are always formatted with FLV, MKV, 3GP, VOB, WMV, etc., which are unacceptable for iPhone iPad. In a bid to playback downloaded free movies on iOS iPhone iPad, you need to take advantage of the video conversion feature from MacX Video Converter Pro since this video converter software can help you directly convert movies to iPhone (XR, XS, XS Max), iPad mini/Air/Pro at No.1 fast speed and intact quality. Apply top free movie apps for iPhone in this tutorial to freely stream and download HD/4K UHD movies on iPhone X/8/7/6/SE. Besides, you also can learn the easiest way to speed up iPhone when running free movie apps for iPhone. This guide centers on how to download Popcorn Time for Mac to free watch movies TV shows with no error and shares an alternative to Popcorn Time iPad/iPhone/Mac/Android in case you still run up against Popcorn Time not working on Mac issues. MovieBox Not Working on iOS 12/11 iPhone iPad? Now MovieBox Works! MovieBox won't open? Not working on iOS 12/11 iPhone iPad any more? No worries! Here I will share with you the effective solutions to MovieBox stopping working problems. MacX Video Converter Pro is an all-in-one video converting program with top quality and fast speed. With the aid of this feature-rich video converter, you are allowed to convert various HD or SD videos to mobile devices.